Vernon Badger Epley, age 92, of Rutherfordton, passed away Saturday, May 6, 2017, at Holly Springs Senior Citizens Home. He was a native of Rutherford County and the son of the late Badger Epley and the late Lula Haynes Epley. 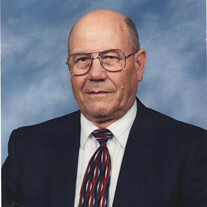 He was a member of Oak Springs Baptist Church and retired from Spindale Mills after 44 years. He was preceded in death by his wife Vernie, a three year old son Robert Vernon Epley Jr., three brothers; Elvin, Edward and James Epley and three sisters; Etta Millard, Ethel Owens and Aline Champion. A special nephew Hicks Owens and a number of other nieces and nephews. The family will receive friends from 1:00 PM to 2:00 PM, Tuesday, May 9, 2017 at McMahan's Funeral Home. The memorial service will be at McMahan's Funeral Home Chapel at 2:00 PM, Tuesday, May 9, 2017 with Reverend Wayne Toney officiating. Interment will be at Shiloh Baptist Church Cemetery. The family would like to thank the staff of Holly Springs Senior Citizens Home and Hospice of Rutherford County for all the love and care you have given to Vernon and showed to us his family. Online guest register at www.mcmahansfuneralhome.com. McMahan's Funeral Home & Cremation Services in Charge of the arrangements.